Today was an interesting Friday for this Farm momma. I started the day early in San Antonio, Texas as I had been there for meetings this week. It had been in the high 60s while I was there. When I landed back in Indiana late this morning, it was 25 degrees and snowing. It snowed pretty hard until about 3pm and then the sun came out but it remained in the low 20s. This climate is one of the reasons we raise our pigs indoors in climate controlled buildings that are kept at 70 degrees year round. So as it was cold and snowy outside today, our pigs were warm and dry inside the barn. This is important all the time, but was especially important today. We have new pigs born on our family farm almost every day, but today we had a gilt, which is a female pig that has never had a littler of pigs AKA a first time mother, go into labor and she was having a really difficult time. Thankfully we did not have to worry about the cold, snowy weather adding to her stress level. In fact, we were able to provide her with a lot of one-on-one care today since we raise our pigs in climate controlled rooms and they farrow (give birth) in individual stalls. The care of our pigs always comes first on our family farm and today was no exception. I can only hope that we were able to provide this particular first time momma the extra special care that the wonderful nurses at our hospital provided me when I had our children. This is in one of our sows and litter in the farrowing stall in one of our farrowing rooms. As I said above, this is where the mother will give birth to the baby pigs. We keep the rooms around 70 degrees year round for the comfort of the sow (a female pig after she has had a litter of pigs) and baby pigs. We track each sow beginning the day they arrive on our farm. We keep track of each time she is bred, when she farrows (gives birth), how many pigs she has, how many pigs she weans and the amount of assistance given to the sow during farrowing (the birthing process). The stall you see here provides protection for the newborn pigs so the sow doesn’t lay on her pigs. It also keeps the sow in a safe environment during the birthing process. 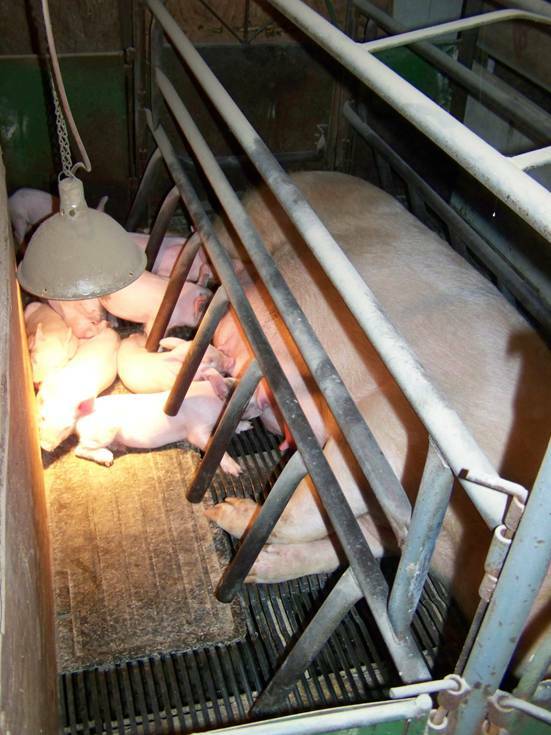 The heat lamps provide the piglets with added warmth. Our farrowing rooms are washed with every turn of the barn, when 1 group of sows weans their pigs, we wash and disinfect the barn before the next group enters the room. P.S. On a different note, be sure to check out my friend Cris' Gooseberry patch give-a-way at GOODEness Gracious. Great post with lots of good info about the comfort of your piggies! Great post! Your explanation and photo clearly explain the benefits to using stalls! We had a friend yesterday nursing a new lamb. Not sure if it made it, but it really is a huge investment for the babies to survive in our world. It's a whopping 5 degrees outside as I type this. I would stay in my 70 degree environment if I could!